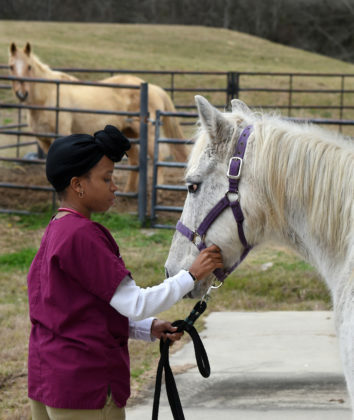 Home ♃ Recent Stories ☄ How Tuskegee U. educates 70% of African-American veterinarians in the U.S.
How Tuskegee U. educates 70% of African-American veterinarians in the U.S.
Not far from the main campus of Tuskegee University are four large barns that house horses, cows, goats, sheep, pigs—“common farm-animal species”—awaiting checkups and exams. 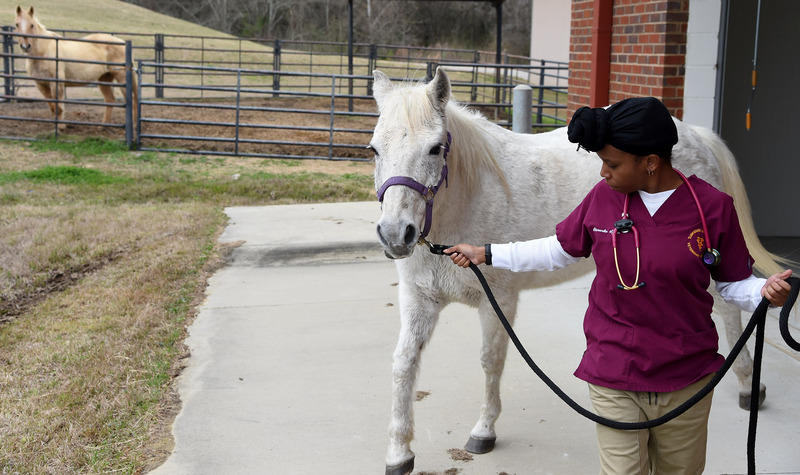 The barn is about a 10-minute walk from a small animal hospital that provides emergency and critical care, dentistry, surgery, and other veterinary services. Outside the barn, slightly up the hill, stretch approximately 40 acres of pastureland for horses and cattle. 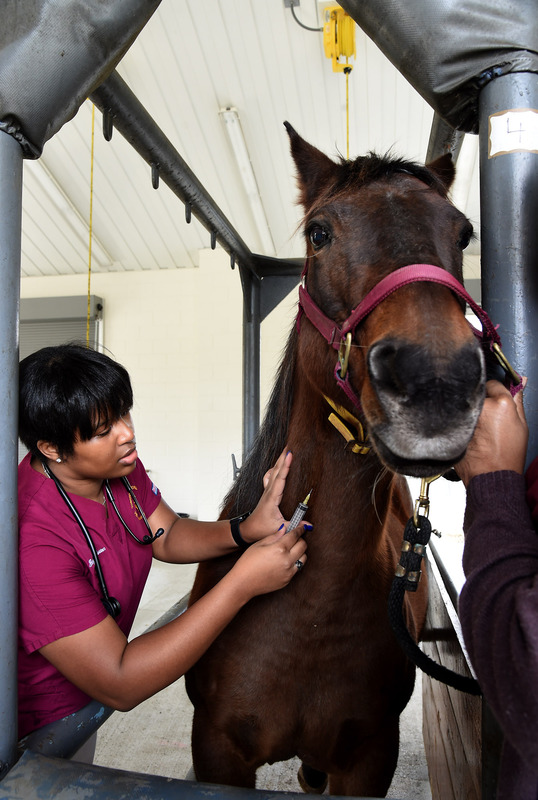 Welcome to the Tuskegee University College of Veterinary Medicine (TUCVM), the only veterinary medical professional program located on the campus of a Historically Black College or University (HBCU). 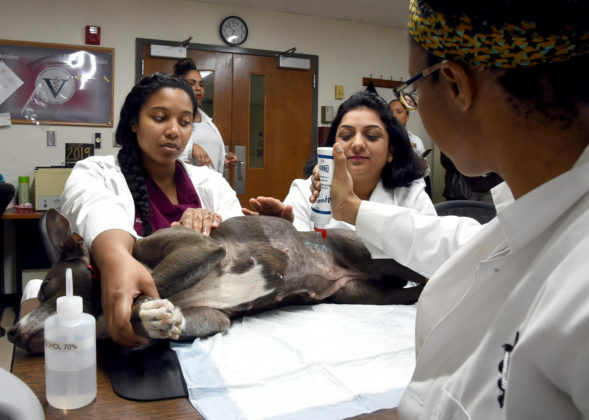 The TUCVM has educated about 70 percent of African-American veterinarians and is recognized as the most diverse of all 30 institutions of veterinary medicine in the nation. Its students, who hail from the U.S. and several other countries, form a bond unlike any other. 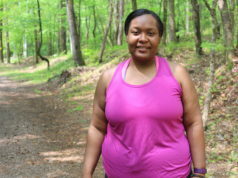 Alums can be found serving in prominent positions throughout the U.S.—and in Birmingham, too. At Southern Research, a nonprofit research organization, Sheila D. Grimes, PhD, DVM, serves as an anatomic pathologist and oversees a team of pathology, histology, necropsy, and clinical pathology personnel. 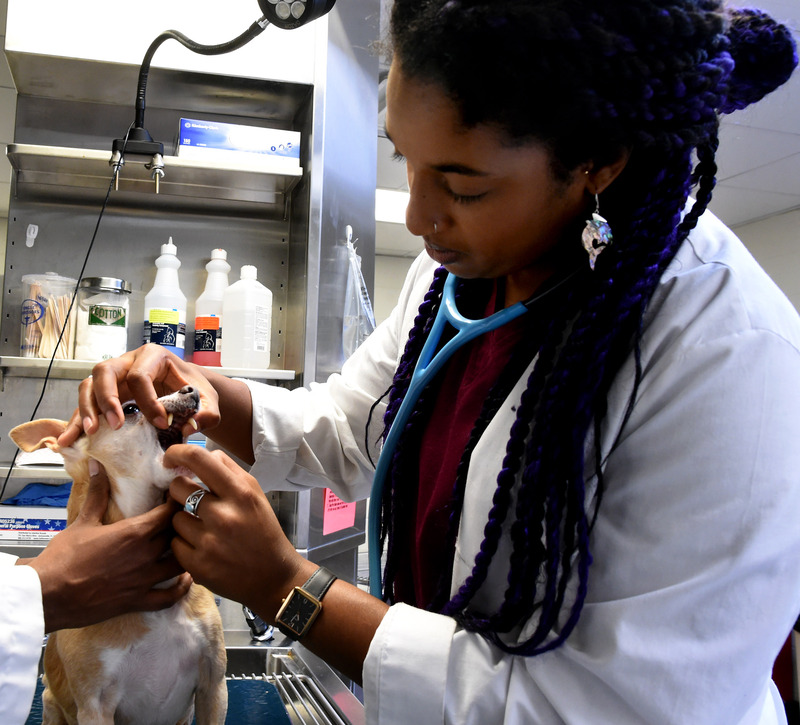 A veterinary pathologist with more than 30 years of experience, Grimes earned her Doctor of Veterinary Medicine (DVM) and Bachelor of Science (BS) degrees from Tuskegee. “We are proud to see professionals of all colors and from walks of life being served so well by a Tuskegee University degree throughout their veterinary careers,” said Tuskegee University President, Lily D. McNair, PhD, who was inaugurated last week as the first woman to serve in that position for the institution. To get a closer look at Tuskegee’s top-notch veterinary medicine program, the Birmingham Times recently spent a day on the Montgomery-based campus, visiting the barns, viewing the animals, and speaking with administrators, faculty, and students. 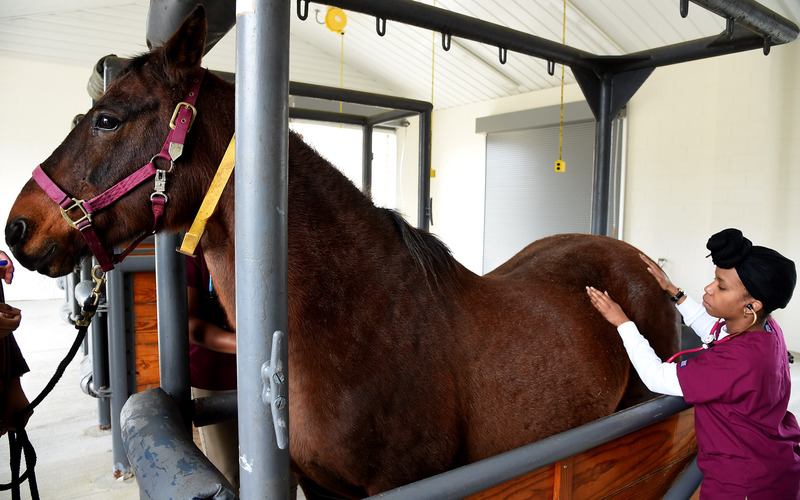 The Palpation Barn on the Tuskegee campus is an enclosed, self-contained facility, where veterinary students learn how to examine horses to evaluate the animals’ reproductive and gastrointestinal systems. Nearby are the Hay Barn, Equine Barn, and Food Animal Barn. 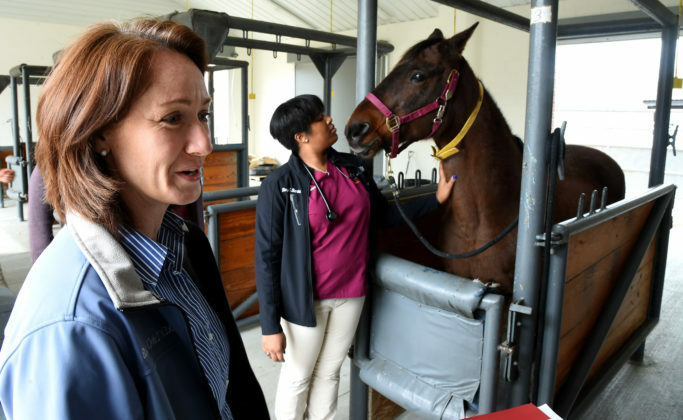 Under the care of TUCVM students, the horses live pretty good lives at the university, said Elizabeth Yorke, DVM, Section Head for Large Animal Medicine and Surgery. 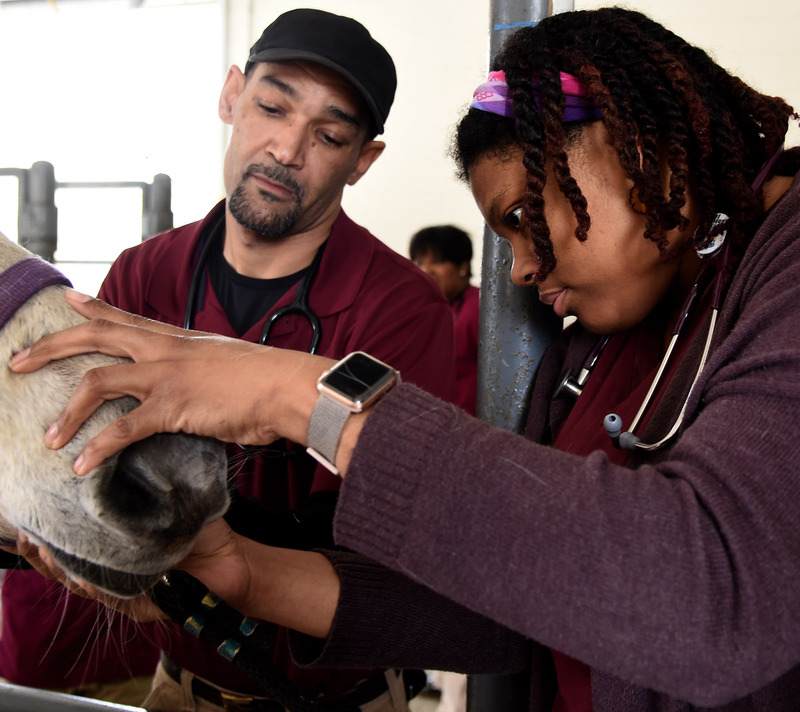 The animals are fed and get regular checkups from students who gauge vital signs like temperature, pulse, and respiration. 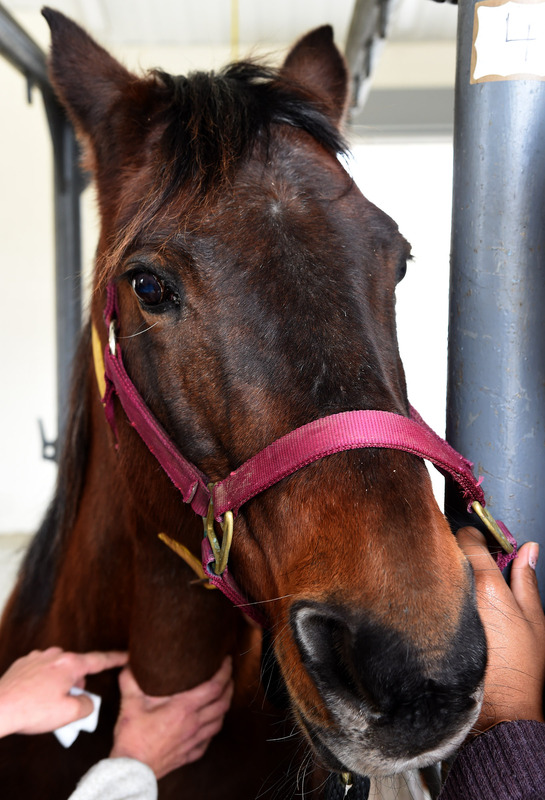 In addition to the horse barn, the TUCVM has a Food Animal Barn, which houses cattle in need of treatment. The institution also has a herd of goats. “We do a little bit of everything,” Yorke said. 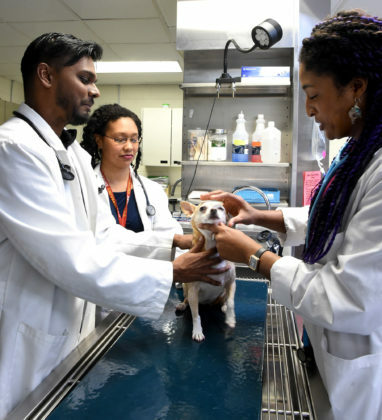 The small-animal hospital consists of wards for cats, dogs, and “pocket pets” (hedge hogs, guinea pigs, snakes, lizards, etc.) that include treatment areas, an intensive care unit (ICU), and surgery suites. 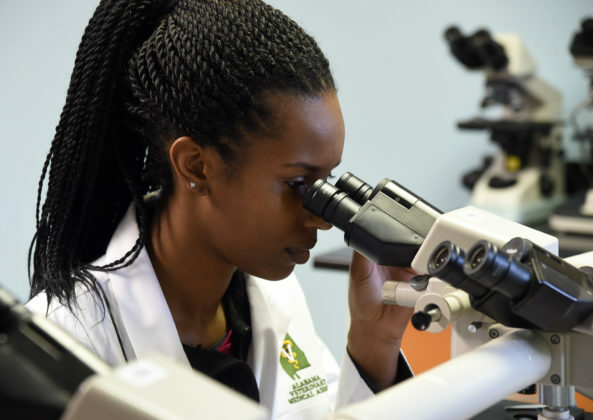 The facility provides emergency and critical care, as well as dentistry, internal medicine, outpatient services, soft-tissue surgery, orthopedics, neurosurgery, and ophthalmology. Mostly juniors and seniors are taught in the animal hospitals: “[The] first year is a lot of book work with an introduction to clinicals. The second year is book work with a little bit more introduction to clinicals. The third year is half and half. 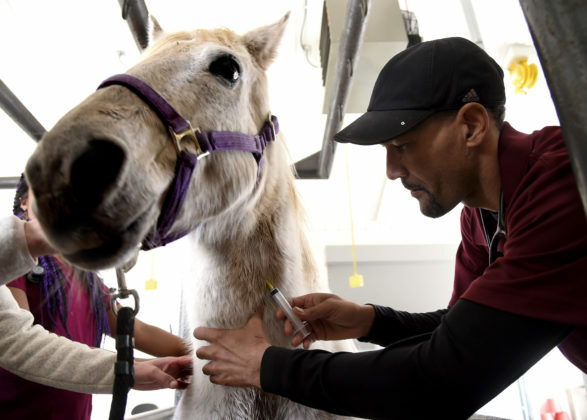 The fourth year [involves] clinical rotation,” said LaTia McCurdy, TUCVM Director of Veterinary Admissions and Recruitment. Students receive training via large-animal and small-animal rotations. 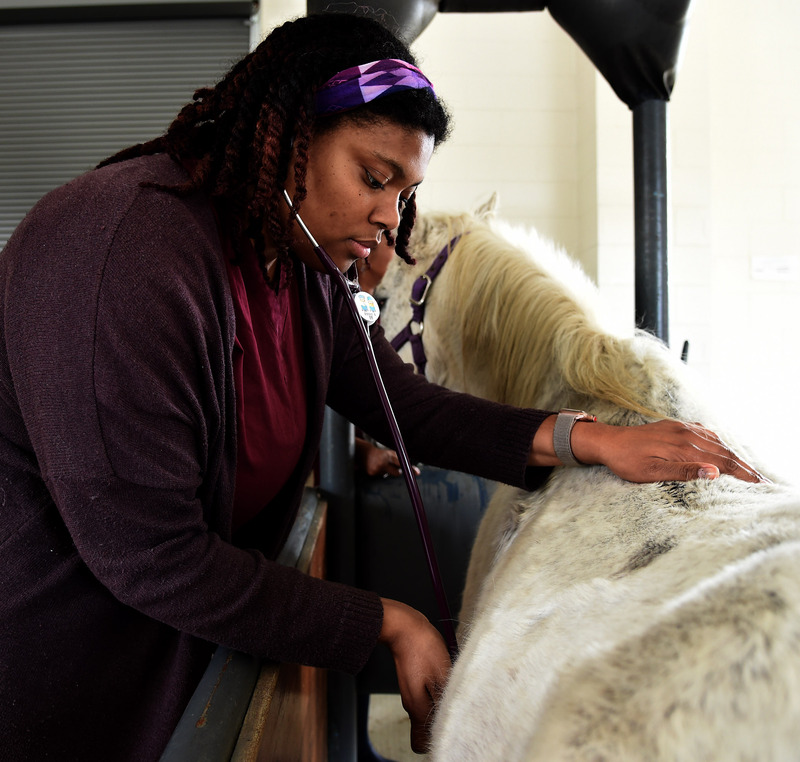 They also learn specialty services, such as radiology. Students spend a lot of their time in the radiology viewing area doing diagnostics. 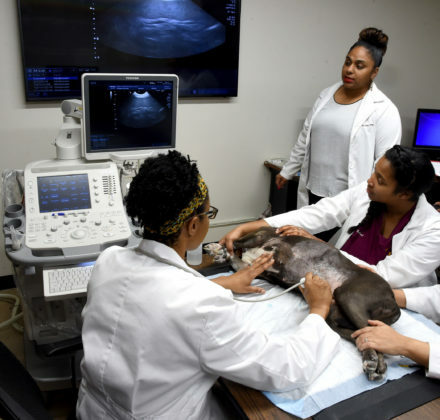 “Often, X-rays are a part of those diagnostics, so this is where students … make interpretations of the X-rays and talk through things,” said Pamela Martin, DVM, Head of the Department of Small Animal Clinical Sciences. 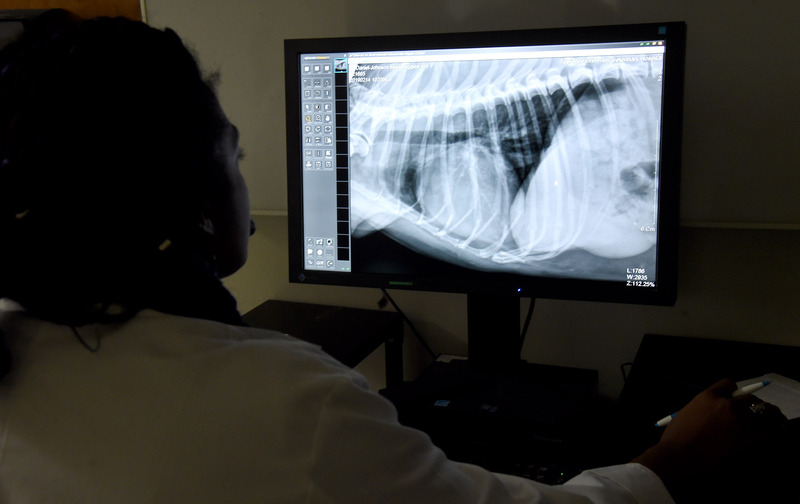 TUCVM students also get the opportunity to compare previous and recent X-rays of returning patients. When they see patients, Martin said, students are conducting practice examinations and learning skills they’re expected to know as graduates. After assessing a patient, students develop a plan. Students spend a little more time with internal medicine services “because our patients can be [either acutely or chronically] ill; … they may spend 10 to 12 hours here on a daily basis for the time they’re on their rotation,” Martin said, adding that other rotations may require four or five hours a day, depending on the service. 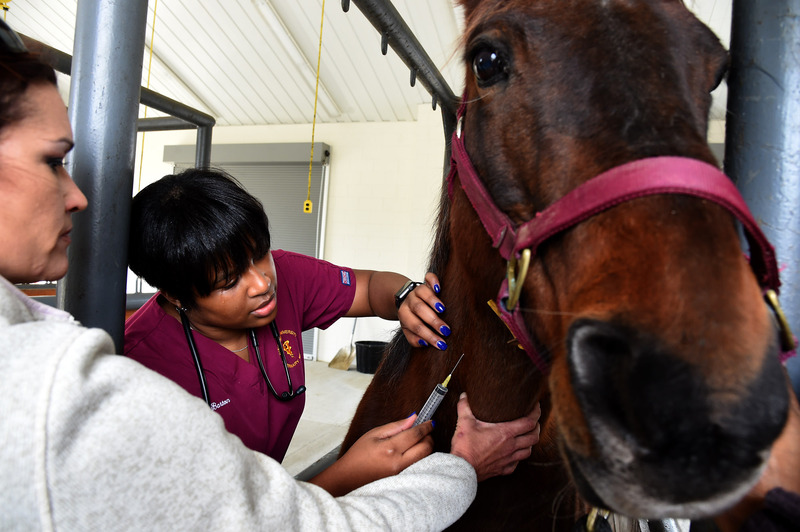 Once a year in the spring, Tuskegee hosts an animal health fair, “which offers discounted services for vaccines, deworming, and physical exams. 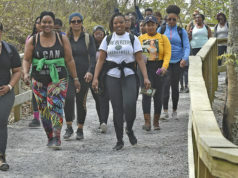 It’s a full day for anyone who wants to bring their animal for some services that are discounted on that day,” Martin said. The TUCVM was established in 1945 to educate African-Americans during the time of segregation. When the program started, there were fewer than five black veterinarians practicing in the South; it was formed because black farmers were unable to find veterinarians to take care of their farm animals. 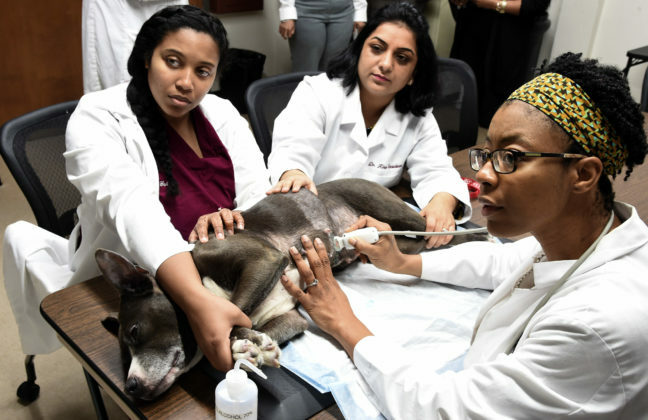 The primary mission of the TUCVM is to provide an environment that fosters a spirit of intellectual curiosity, creativity, critical thinking, problem-solving, and leadership that promotes teaching, research, and service in veterinary medicine and related disciplines—and that mission has not changed, said TUCVM Dean and Professor of Radiology Ruby L. Perry, DVM. The veterinary medicine programs at Tuskegee align with the university’s rich tradition of science, technology, engineering, and mathematics (STEM) education, McNair said. 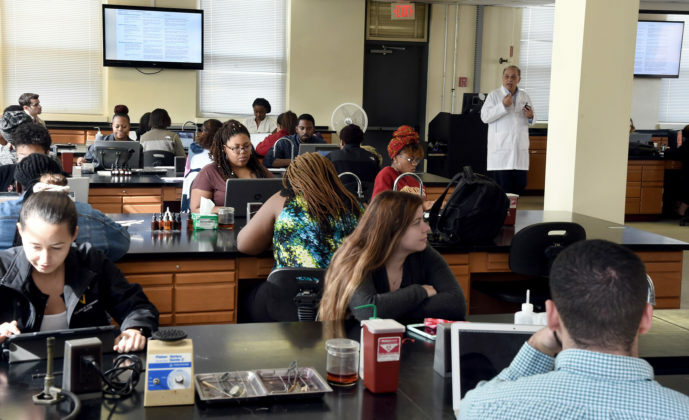 “This certainly is demonstrated by how many of our students and faculty benefit from cross-disciplinary studies and research between the college and other science-focused programs, such as agriculture, animal sciences, biology, and food safety and security,” she said. 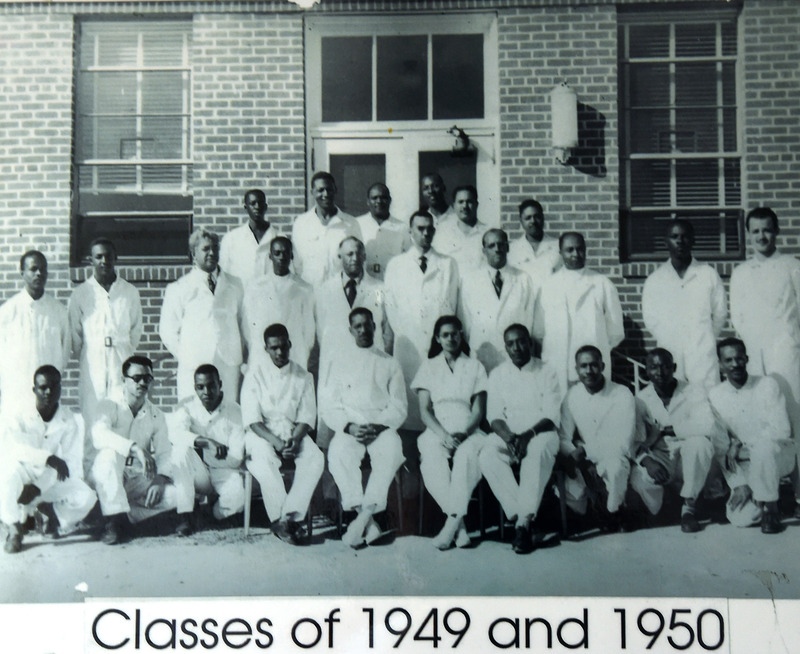 Faculty members also know firsthand the benefits of a Tuskegee education. 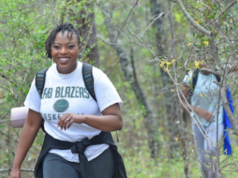 Perry, for instance, is an alum who returned to the institution to make a difference and be a trailblazer, a value that is inspired in every Tuskegee University student.